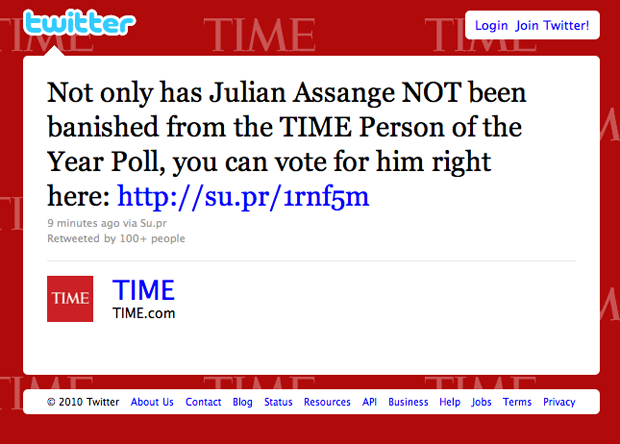 Shortly after Wikileaks’ founder Julian Assange’s arrest in London today, rumors spread rapidly on Twitter that Assange had been removed from the Time magazine Person Of The Year poll. It looks like the rumors got started when the @Anon_Operation Twitter account tweeted out a link to the wrong poll which got re-tweeted about a hundred of times, and the meme was passed on by influencers like Business Insider’s Henry Blodget and our very own John Biggs. The @Anon_Operation account itself is affiliated with Anonymous, the Internet vigilante group responsible for voting 4Chan founder moot Time Person of the Year in 2009. It seems as though Anonymous’ subsequent campaign to drive Assange to the top of the list has been successful as the controversial figure is now at 251,202 votes, versus Steve Jobs at 20,767 and Mark Zuckerberg at 14,599. Despite the Assange being in police custody until December 14th, the WikiLeaks Twitter account is still tweeting and more cables are apparently being released tonight. Along with moot, other notable Person of the Year winners include Adolf Hitler, Albert Einstein, Joseph Stalin and Barack Obama. The Time Person of The Year issue hits the stands the last week of December.